A luxurious cashmere wrap is an elegant way to top off any look, and the wraps from Quinn are extra special. They are made with pure, first-grade cashmere sourced from goats raised in inner Mongolia, a region renowned for its ultra-soft cashmere. 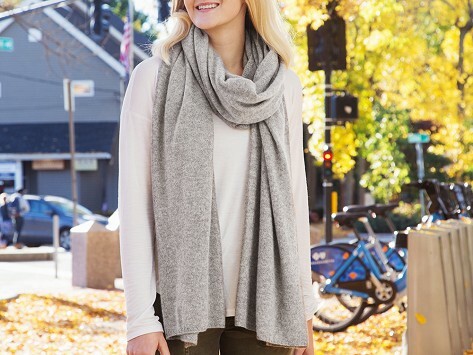 It’s lightweight and versatile—wear it as a shawl, a scarf, or use it as a cozy mini-blanket while traveling. Dimensions: 16.5" x 11" x 1"
It is longer and skinnier than other wraps, but the cashmere is beautiful and warm. I will get lots of use from this.